Cut flower bouquets are beautiful and can liven up any room. Eventually those flowers will wilt and die, though--unless you preserve them. Cut flowers can be preserved forever through the process of drying. Flowers are often preserved as a memento from special occasions or just to extend the life of flowers so they can be enjoyed all year. Drying flowers to preserve them is fairly simple. The process only requires time and a place to hang your flowers while they are drying. Lay the stems of the flowers together so that the ends of the stems meet. Cut a piece of twine. The twine should be long enough to tie the stems together and leave enough length to hang the flowers. Wrap one end of the twine around the flower stems and tie the stems together. Hang the flowers upside-down in a dark room, such as a closet, pantry or attic. Tie the end of the twine not tied to the flowers to something such as a hook or clothes hanger that will allow the flowers to remain hanging. Dry the flowers by allowing them to hang until the moisture in the flowers evaporates. Drying can take two weeks or more. 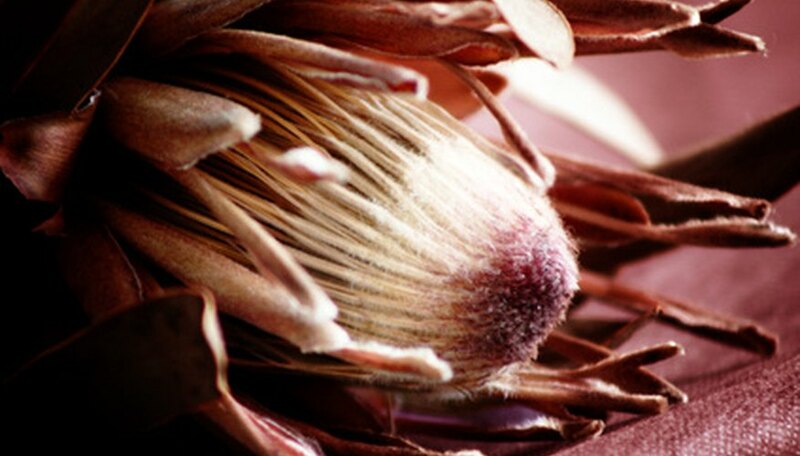 The flowers are dried when they appear more condensed and feel crisp when touched. Set dried flowers in a decorative vase. Handle dried flowers carefully as dried flowers can easily fall apart. Wrap dried flowers in newspaper. Store them in a closed shoe box with a few small holes poked through the top, bottom and sides of the box. Choose low humidity locations for drying flowers--basements or garages will add moisture to the flowers and will prevent them from drying properly.